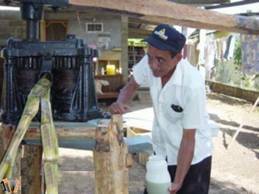 The “Trapiche”: The “trapiche” is the tool that utilizes our country people to extract the juice of the sugar cane for subsequently cook it and thus to extract the sugar cane honey, which is a substitute of the sugar. The “trapiches” are done under leafy trees of the farms and on the banks of the rivers in the summer period. These they are made of woods (as traditionally they were used) or of iron, this last one is the most currently used. The”trapiche” is thrown for horses hitched in the “trapiche” mast where is turned round so that the machine of the “trapiche” can grind the sugar cane. Here a Panamanian use trapiches to grind the sugar cane and extract the “honey”. This honey is used for flavoring and for traditional Panamanian drinks like Seco. Come visit the Azuero Peninsula, and the beaches of Pedasi to try a Seco and soak up the endless sunshine. When you fall in love with the Azuero Peninsula and towns like Pedasi and Pocri contact www.PanamaVactationRealEstate.com for your real estate needs. The “Piladera de arroz” consists to meet several people after the joint for cutting the rice in order to thresh and peel the rice that is going to be consumed in certain time. Always, it was done under the leafy trees in which the “pilones” [ wood mortar used to grind the rice] and “las manos del pilon” [kind of mallet used to grind the rice], next to the deep wood tray and the canvases where the rice is aired. 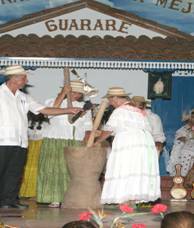 This is a picture of people in the town of Guarare on the Azuero Peninsula grinding the rice. Rice is a staple food in Panama. Many farmers on the Azuero Peninsula grow rice to sell and use as cattle feed. When you visit the Azuero Peninsula in search of real estate make sure you stop and sample the local cuisine. • Sage (“Pluchea carlinensis”) the leaf is used. • “Sábila” [Aloe Vera] (Aloe edge) the gel of the leaves are used for medicine. • Apple Mint (“Lippia dawn”) its leaves are used. • Lemon Balm (“Melissa officinalis”) its leaves are used. 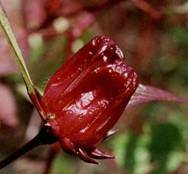 • “Saril” (“Hibiscus sabdariffa”) the flower is used to prepare soft drink. • “Cola de Caballo” (Equisetum bogotense) the stem is used for medicine. • Herb of Lemon (Cymbopogon citratus) the leaves are used to do tea. • Ginger (“Zingiber officinale”) the fruit is used to flavor the foods. • Oak Tree (“Tabebuia rosea") its wood is used for the construction. • Pepper (“Capsicum annauum”) the fruit is used to flavor the food. • Fennel, its leaves are used to give a nice smell to the clothes when it is washed. • “The Chumico” was used to scrub the kitchen utensils and also as a shower scrub. This is the Sabila plant or in the United States it’s called the Aloe plant. This plant can be found all over the Azuero Peninsula. It is used to heel sunburns, cuts, and other scraps. The Azuero Peninsula has numerous useful plants. The saril plant can be found all of the Azuero Peninsula. It is used for flavoring drinks. So when you visit Panama during Carnival and head to the Azuero Peninsula to towns such as Pedasi and Las Tablas when drinking your Seco you might have it flavored by the saril plant. Many properties on the Azuero Peninsula have these gorgeous plants blooming all over the place. Come own your personal dream house on the Azuero Peninsula.